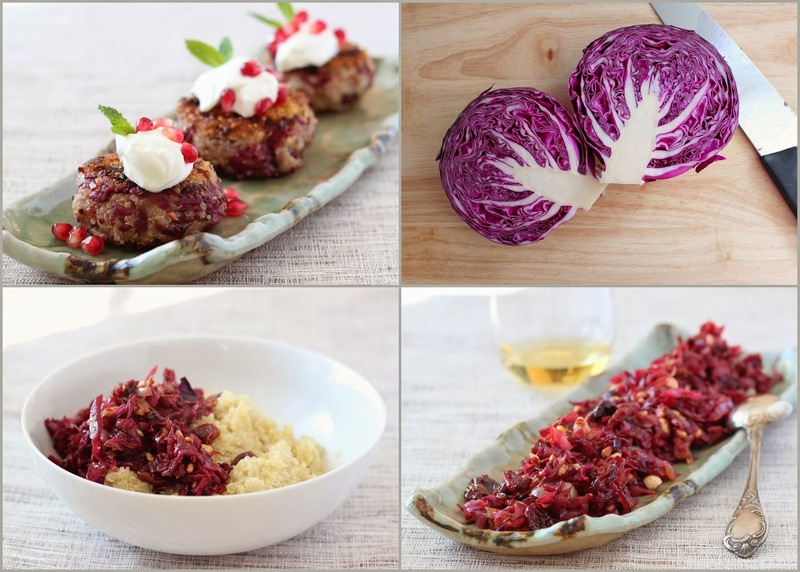 Rare is a food blog these days that hasn't written about quinoa cakes. But these are a little different. Not only are they the tastiest quinoa cakes that I've tried so far, but they don't use eggs, which has a number of benefits: my egg-allergic 3 year old and my vegan students can eat them. I got this idea from Mark Bittman's recipe in the New York times. Does anyone else love Bittman as much as I do? How many times has food media made you feel that your food will never be this pretty, or this tasty, or this rustic, or this modern, or this complex? But in comes Mark Bittman, and our confidence is restored. He takes a failure, overcooked and mushy quinoa in this case, and turns it to his advantage. When quinoa gets mushy, it holds together without eggs, but has the capacity to turn delightfully crispy on the outside when seared in a pan. In his signature minimalist manner, Bittman keeps these cakes simple. The only additions are cilantro, scallions, and hot sauce. Not only does this recipe produce lovely cakes, but it also leaves you plenty of room for creativity. I have successfully mixed different veggie leftovers into them with great results. Here is an example made with red cabbage that I wrote about recently. The recipe below is adapted from Mark Bittman's recipe in the New York Times. After making these cakes a few times, I added a few tips that make them sturdier and easier to work with. This makes the process a bit longer, but not harder. All the additional time is passive, so I suggest you make these the day before serving. Put the quinoa, salt, and 2 1/4 cups water into a medium saucepan. Bring to a boil, cover, and cook on low heat, until no water remains and the grains are very mushy, about 30 minutes. Stir thoroughly to release the starch. This will make the grains come together in a cohesive mass and will make the cakes a lot sturdier. Cover with a damp towel and wait until quinoa is cool enough to handle. If quinoa got too cold and hard, warm it up with a splash of water, stirring occasionally to return it to a sticky and soft state. Fold the braised red cabbage into quinoa. Taste and correct salt and pepper. With your hands, form the mixture into patties that are around 2.5 inches in diameter and 3/4 inch thick. Refrigerate for at least 1 hour or overnight. Put 2 Tbsp oil into a large non-stick skillet over medium heat. When the oil is hot, add the cakes and cook until the bottom is nicely browned and crispy, about 4 minutes. Flip, and brown on the other side, another 4 minutes. Serve immediately with sour-cream (or thick yogurt) and pomegranate seeds. * If using a vegetable that oozes out water, like spinach, swiss chard, etc, squeeze it out after cooking it before you fold it into quinoa. I really love Mark Bittman, too. His cookbooks are my kitchen bibles, and they see me through just about every possible dinner mess or disaster. In fact, I need to crack open How To Cook Everything to figure out how to roast a duck for my Valentine! Save yourself a lot of trouble and a disaster and don't roast a duck whole. If you want to do breasts, sear them. If you want to do legs, braise or confit them. The cherries are part of the braised cabbage recipe, but they are optional, so feel free to skip or replace with some other dry fruit.